Whisk the flour, brown sugar, baking powder, and salt together in a large bowl until incorporated. In a separate bowl, beat the eggs. Add in the ricotta cheese and whisk until smooth. Add the milk, lemon juice, lemon zest, and vanilla to the egg mixture. Whisk to combine. Slowly pour the wet ingredients into the flour mixture, whisking until the flour soaks up the liquid and the mixture is homogenous. Heat a griddle or skillet over medium heat. Working in batches, add a tablespoon of butter at a time to the griddle or skillet and let melt (it will take only seconds). Ladle the pancake batter onto the surface, creating your desired size pancakes and evenly spacing them apart. Cook on one side until golden brown and bubbles begin to form on the top. Using a spatula, flip the pancake over and finish cooking on the other side. Keep the pancakes warm as you finish cooking all the batter. Combine the blueberries, sugar, and water in a saucepan over medium high heat. Let the sugar dissolve and the mixture begin to bubble. Once the blueberries start to burst, reduce the heat and simmer until you’re left with a syrupy sauce. If you let it cook too long and the sauce becomes thick and clumpy, just add a little more water and simmer again. Serve the pancakes in a big stack with a piece of butter and lemon slice on top. 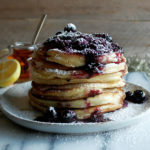 Drizzle with a generous amount of maple syrup or blueberry syrup. Or, better yet, both! Sprinkle with powdered sugar to finish.